This past week/weekend brought about a lot of interesting and new experiences for me- some better than others. You can take that as you will. I always look forward to the weekend, especially since mine always consists of three days instead of two;-). Anyway, in case you find my life as exciting as I do continue reading- if nothing else, you can have a few laughs at my expense☺. Take one guess on what you think this group means? I’ve been going to my church for some time now but I haven’t gotten too involved for various reasons, mainly due to time constraints. My brother was told about this group to try out on Thursday nights and I figured I would try it out too. The only thing I knew about the group was that it was for people who were not married and the worst part was the “all ages welcomed” that was included in the description. My immediate concern was that there will be older than me people there looking for a spouse instead of people my age looking for fellowship. That always freaks me out for some reason. I think church is a great place to meet your spouse or by being involved with church activities but I guess I don’t like it when groups are designed for that. It is just weird to me, something unnatural. I mean I think we should all do are part and not sit at home and expect God to just send our spouse knocking on our front door but I think those groups can lead themselves to put a lot of pressure or awkwardness on people. Along the lines of my previous post about hating the word “date.” Maybe I’m just weird- that is a strong possibility too. So my brother and I show up at this group about 30 minutes early and I told him that we would watch from the car so we could see who was going in first and scope it out. Is that wrong? There were literally no cars for about 15 minutes but at least we had good conversation about our worst nightmares coming true once we went to the group. I had originally planned to go in 10-15 minutes early but with the way things were looking, I was about to propose we go to dinner instead. It was at about 5 minutes to when it was supposed to start and a car pulls up. I guess a woman in her 40’s would soon emerge from the vehicle, my brother guesses a man in his early 30’s. As soon as their car door opens, we both start laughing. I was right. We wait a few minutes and no one shows up. My brother convinces me to walk over and at least look to see if others are there. We do. We peak in the window and it’s just the woman sitting at a table by herself. I know you might think I’m childish but I call my mom to vent about my hesitation and how this is a waste of time. She calms me down and explains how I should give it a chance. We end up going in and making conversation. More people eventually show up. And there was dinner. Food always makes me happy. The “woman in her 40’s” was actually younger; everyone who ended up showing up was around my age. It really wasn’t that bad and I appreciated the opportunity to meet others. I might even go back:). Friday night I went on a double date with my boyfriend, one of his friends, and his friend’s wife. I haven’t really gone on many of these types of dates in the past, usually because I never really had a date. I was normally the third wheel with my best friend and her husband, even before they were married. As I’ve matured (not sure if this is really true), I would normally find a guy to bring along so it would be more balanced out but it ended up just being more awkward honestly. But this double date was actually fun. We met them for dinner and I devoured my meal. Just something about chicken and mac n’ cheese that does that to me lol. 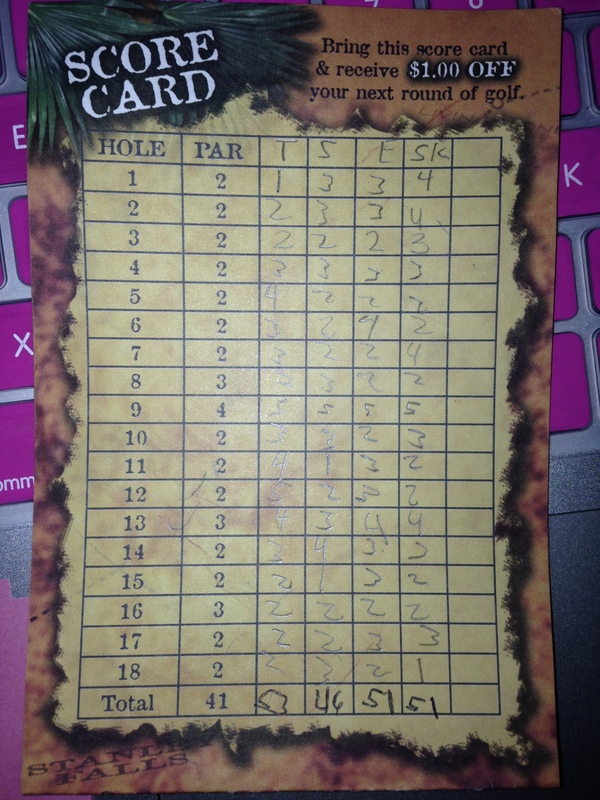 Afterwards we went to play putt putt and I can be a little competitive when it comes to games, actually probably anything in life. My boyfriend and I made a bet to see who would win. ; bets always add a little excitement to it. He is a little competitive too and can be pretty ruthless. I had to win though, mainly because I couldn’t lose. If I won, I get to pick anything from the mall but if he won, I’d have to watch a sci-fi movie. Now you see why I couldn’t let him win. Worst movies ever. I guess that’s what happens when you date a dork, or as he likes to be called- a geek. One the first hole, he got a hole in one. I was ready to go home after that. But I persevered and guess who ended up winning?! I really do thrive under pressure. How else would I have made it this fall in grad school?! ;-) My boyfriend ended up coming in last. Hopefully he doesn’t get mad about me posting that. Regardless, double dates can be lots of fun! Saturday night my boyfriend’s parents hosted a couple’s game night. It was guys versus girls and I already had been talking smack. There were about 8-9 couples there who were married; we were the only couple who wasn’t lol. Most of them were older and I actually loved that! I think sometimes younger people tend to hang out with only those of their similar age, but I have learned so much from those that are older than me. They have so much wisdom and life lessons and I always appreciate the opportunity to interact with them, as well as seeing their beautiful marriages. Anyway, we ended up playing two games- pictionary and taboo. The girls ended up winning by a landslide in pictionary! I wish I had taken pictures of some of the drawings though. We were laughing a lot. Taboo used to be one of my favorite games but is also super tough when you can’t say certain words. One of my favorite parts is buzzing your partner when they mess up and say a word they aren’t supposed to. Unfortunately, my boyfriend is pretty good at following directions so I wasn’t able to buzz him. The guys ended up winning that game but I think the score got messed up;-). I had a lot of fun this weekend but after writing all of that, it seems a little boring and dull. Maybe that is why most tv shows and movies are filled with affairs and other bad decisions. It some ways they appear exciting and/or make up feel better about our lives. But we don’t have to live with the consequences of those choices in the movies. My life is pretty exciting, fulfilling, and normal. Okay maybe not normal but close. This journey is about growing and learning to love deeper. Hope you all had a fabulous weekend and a terrific Monday! This entry was posted in Advice, Bible, Christian, dating, God, Love, Popular, relationships and tagged Bible, Christian, dating, God, Love, relationships. Bookmark the permalink.